SAN FRANCISCO, CA--(Marketwire - October 18, 2010) - Eloqua, the leader in marketing automation solutions that dramatically accelerate revenue growth, kicked off its Eloqua Experience user conference by publishing the industry's first report that provides marketers with data-driven benchmarks against which to compare their marketing automation, email marketing and lead generation efforts. Eloqua collected 10,000 months of aggregate campaign data from more than 700 B2B and B2C companies across several industries, making it arguably the single most data-rich marketing automation report ever produced. Authors then incorporated best practices counsel throughout the report to help readers achieve best-in-class performance and drive revenue growth for their businesses. The Explosive Growth of Marketing Automation: Both B2B and B2C companies are rapidly adopting marketing automation, specifically for lead scoring, event marketing, and lead nurturing. As marketers are asked to do more with less, adoption continues to soar. Marketers are Leveraging Lead Scoring: Marketers are regularly using lead scoring to qualify the quality of leads and are sending high-quality leads to sales for follow-up while entering lower quality leads into a nurturing program. Automated Nurturing Pays Off: Companies of all sizes benefit by adopting lead nurturing to move prospects down the purchase path. Marketers who implement nurturing programs provide sales with a significantly higher number of qualified leads. Improving Event Results: Marketers are increasing the number of new qualified leads from events as automation plays a key role in generating registration, ensuring registrants attend, and following up with communication to attendees post-event. Campaign Sizes are Decreasing: Average campaign size is on the decline as marketers using marketing automation send out smaller and more timely campaigns. These marketers are improving targeting by sending the right messages to the right people at the right time. Email Marketing is Growing: Eloqua found that B2B email marketing is in fact growing, contrary to many predictions and that there is healthy growth because marketing automation allows companies to easily execute email marketing campaigns. "We found that both B2B and B2C marketers leveraging automation technology are producing more targeted campaigns, delivering higher quality leads to sales, and improving overall marketing efficiency," said Paul Teshima, Senior Vice President, Customer Strategy and Success. "With 50,000 worldwide users, the most of any marketing automation provider, we tapped into a wealth of data to learn from companies that really 'get it' and are heavily contributing to their company's revenue." To download the report, click here. Follow all the action live with Eloqua Experience updates using the hashtag #EE10SF. Eloqua helps clients dramatically accelerate revenue growth through Revenue Performance Management. Eloqua provides powerful business insight to inform marketing and sales decisions today that drive revenue growth tomorrow. The company's mission is to make its customers the fastest growing companies on earth. Thousands of users rely on the power of Eloqua to execute, automate and measure programs that accelerate revenue growth. Eloqua's customers include Adobe, AON, Dow Jones, ADP, Fidelity, Polycom, and National Instruments. The company is headquartered in Vienna, Virginia, with offices in Toronto, London, Singapore and throughout North America. For more information, visit www.eloqua.com, subscribe to the It's All About Revenue blog, call 866-327-8764, or email demand@eloqua.com. Eloqua's Paul Teshima, SVP Customer Strategy & Success, discusses the Eloqua Benchmark Report and what it means for marketers. 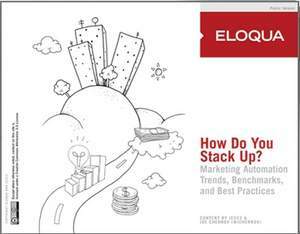 Eloqua's Marketing Automation Benchmark report provides marketers with relevant trends and best practices.